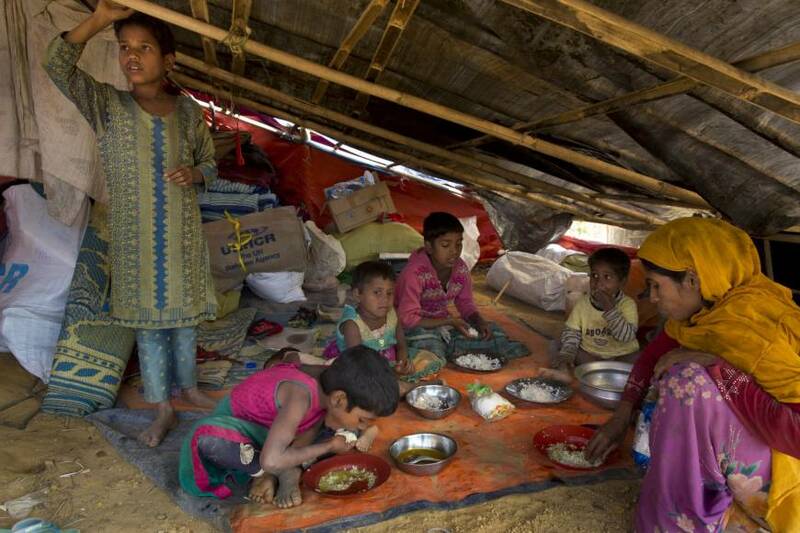 NAYAPARA REFUGEE CAMP, BANGLADESH - Abdul Goni says the Myanmar government was starving his family one stage at a time. By the time Goni saw bodies floating down the local river, of fellow Rohingya killed for illegal fishing, he knew his family would die if they didn’t leave. On bad days, they carved the flesh out of banana plant stalks for food. On the worst days, his children ate nothing. First, massacres, rapes and the wholesale destruction of villages by the Myanmar military in western Rakhine state forced nearly 700,000 Rohingya Muslims to flee to Bangladesh, in reprisal for Rohingya militant attacks on Aug. 25. Now, the food supply appears to be another weapon that’s being used against the dwindling numbers of Rohingya in Myanmar. The accounts of hunger could not be independently confirmed, as Myanmar’s government does not allow reporters into the northern part of Rakhine state, where most of the Rohingya lived. However, more than a dozen interviews by The Associated Press with the most recent refugees show growing desperation, as the noose tightens around their communities in what U.N. officials have said may be a genocide. 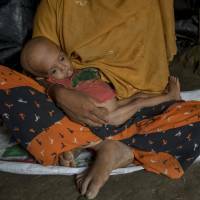 The U.N. and human rights groups such as Amnesty International have also warned of increasing hunger among the Rohingya in areas where conflict and displacement have been most rampant. The Rohingya Muslims, who have been loathed by Myanmar’s Buddhist majority for decades, are locked down in their villages — sometimes even in their homes — and prevented from farming, fishing, foraging, trade and work. In other words, they can no longer do what they need to do to eat. While restrictions on freedom of movement and access to food have long been in place, they have tightened dramatically in recent weeks, the AP interviews show. Repeated calls to Myanmar’s military weren’t answered, but the Myanmar government denies ethnic cleansing and says it is battling terrorists. Social Welfare Minister Win Myat Aye says the government has been distributing food aid to as many people as possible. 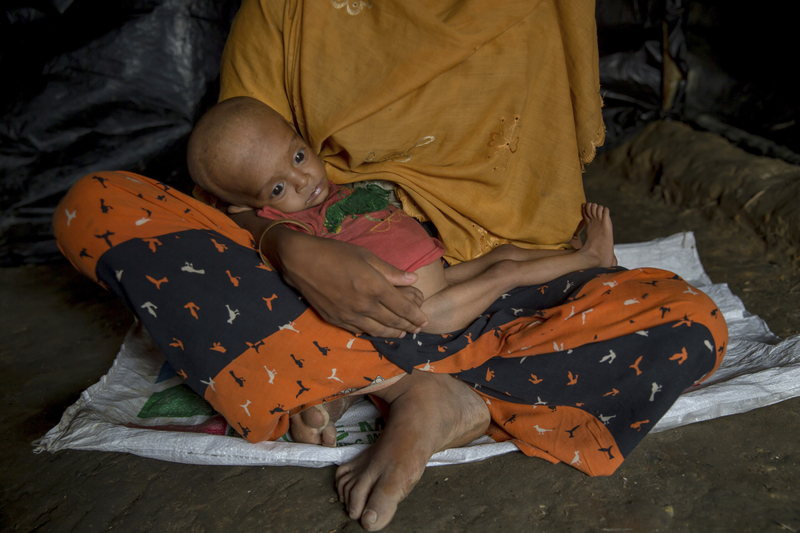 However, the hunger the Rohingya faced at home is evident when they come to the Bangladesh camps, where new refugees, especially children and women, suffer from “unbelievable” levels of malnutrition, according to Dr. Ismail Mehr. The government’s restrictions on access to northern Rakhine makes it almost impossible to tell how many people are without food, how widespread the problem is or whether people are dying. Cecilia Goin, a communication manager with the International Committee of the Red Cross based in Yangon, says that since the end of August her group distributed food to more than 180,000 people in northern Rakhine state. Activists, aid groups and researchers say Myanmar squeezed the Rohingya by severely hampering many of the humanitarian operations that were crucial for their survival. Food disruption was further disrupted by violence in 2016 and the bloodshed after Rohingya insurgents staged an unprecedented wave of 30 attacks on security posts across Rakhine state in August and killed at least 14 people. Even before August, aid agencies in 2017 predicted a spike in severe malnutrition in children. In a report released today, Amnesty International details evidence of forced starvation by the military, including stopping the Rohingya from harvesting their rice fields in November and December. 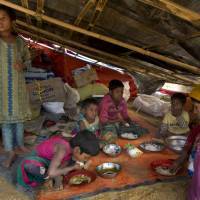 The Food and Agriculture Organization also has warned that the lack of access to food and fuel are adding to hunger in Myanmar. Buddhists in Rakhine state began blocking food aid when they noticed that the Muslims were getting more than they were, according to Thomas MacManus, a specialist in international state crimes at Queen Mary University of London who has researched the Rohingya since 2012. Tightened curfews meant people couldn’t harvest shrimp or rice, tend to their cattle, gather firewood or fish. Since August, an almost 24-hour-a-day curfew means no one is leaving their villages, he says. In this war on food, the rice paddies are a major battlefield. “I always grew my own food, and now suddenly I couldn’t feed myself or my family,” says Ahmed, who is from Zay Di Taung village. After Aug. 25, when he was trapped in his village, Mohammad Rafique, 25, a day laborer from Hpa Yon Chaung, survived on rice he’d stockpiled in his home. When that ran out in October, he sold family jewelry to get rice. When the money was gone, he begged from neighbors who still had rice stockpiles, often going without food so his children could eat. Aid groups couldn’t reach them regularly. The Buddhists blockaded their villages and wouldn’t hire them; they put an embargo on Rohingya goods and even stopped selling them phone cards so they couldn’t communicate with the outside world, according to aid groups. The Muslims ate through their stockpiles; they borrowed from friends and neighbors; then they ran out. Food became so hard to get for Mohammad Hashim, 25, a wood cutter from Pyin La village, that he and his family sometimes ate the broken rice grains normally given to chickens. Goni says that of the 500 families who lived near him, around 150 have fled to Bangladesh. Everyone else wants to leave, he said, but they either don’t have enough money or are too old.